Two years ago, my brother’s friend Bob Sharood started his own exotic organic culinary mushroom farm in Maine. At the time, no one in the state was doing anything like it. Today, Bob’s company, Mousam Valley Mushrooms, distributes mushrooms to many of the grocery stores in Maine. I had tried Bob’s mushrooms before, but I was curious to see the farm operation, so during my trip to Maine, my Mom and I stopped in for a tour. Mousam Valley Mushrooms is a family business. Bob runs the company with his sister, Emma, and his father, John. Bob’s brother Ed is even spending the summer working as an intern. Sometimes you hear about someone joining their family business, but it isn’t often that you hear of someone in their 20s starting their own family business. It was an ambitious project, but having his father’s business knowledge (he has worked as a corporate executive) helped get the plan in motion. 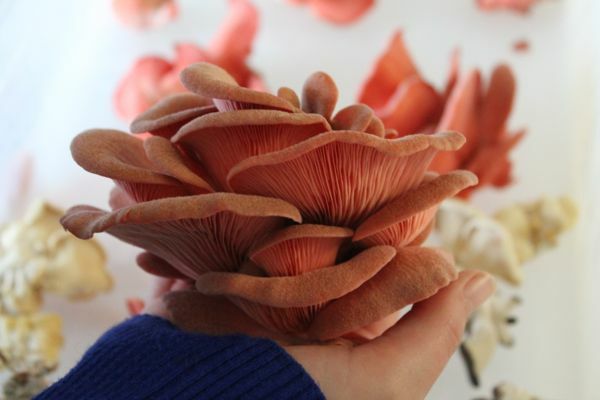 I had no idea what to expect from my visit at Mousam Valley Mushrooms, and upon walking in the door, I was completely blown away. 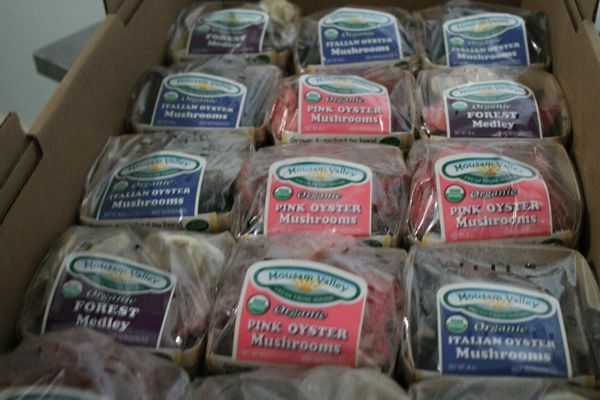 Mousam Valley Mushrooms isn’t a farm, it is a state of the art USDA organic operation. The employees seemed more like scientists than farmers. 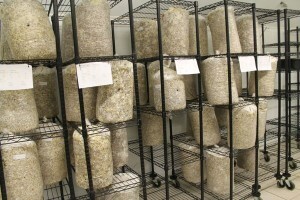 The mushrooms are grown indoors, in an entirely clean environment (hairnets, shoe covers, and hand washing required), using a proprietary fruiting technology and growth recipes. No one else in the country is growing mushrooms in this way. First woodchips made from sustainably sourced local wood, are pasteurized. The woodchips, millet, and other ingredients, specific to each mushroom variety are then combined with the mycelium. 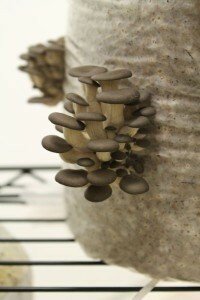 (The mycelium is what the mushrooms grow from, mushrooms don’t grow from seeds.) Then this mixture is placed into bags. The bags go through a series of temperature and humidity controlled rooms. The mushrooms grow through these bags (see below). The entire process takes about 40 days from beginning to end. The entire indoor farm is climate controlled. The mushrooms cycle through rooms with specific temperatures and humidity levels based on the growth process of the mushrooms. The climate of each room is monitored by controls and a computer program – designed with the help of my brother’s other friend Alec. Bob’s scientific approach to growing mushrooms, paired with the precise climate control technology developed by Alec make it possible to grow organic mushrooms in Maine year-round. Before Mousam Valley Mushrooms, buying local mushrooms in Maine year-round wasn’t an option. Bob and Emma very kindly sent me home with some beautiful Italian Oyster mushrooms which I look forward to using in a recipe this week. I hope to check in with Mousam Valley Mushrooms next time I am visiting my family. I am excited to watch this company grow. 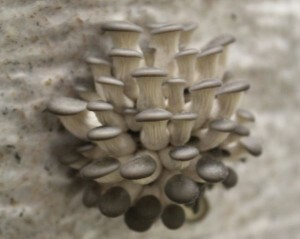 They are certainly growing the most beautiful and cleanest mushrooms I have ever seen. 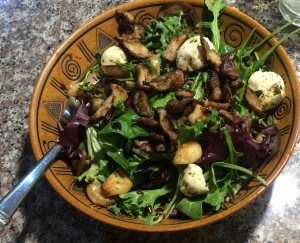 If you are in Maine, Mousam Valley Mushrooms products are available in many Whole Foods and Hannaford stores.